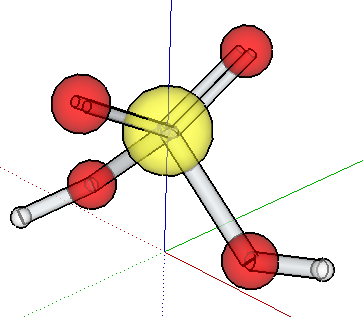 Bonnie's Blog: 3D design for K-12 and beyond: SketchUp Molecules! This plugin appears to be from last year, but I hadn't seen it before and it's AWESOME. If you're a chemistry or physics teacher (or student), give this a try. Open SketchUp and click the Extension Warehouse icon. 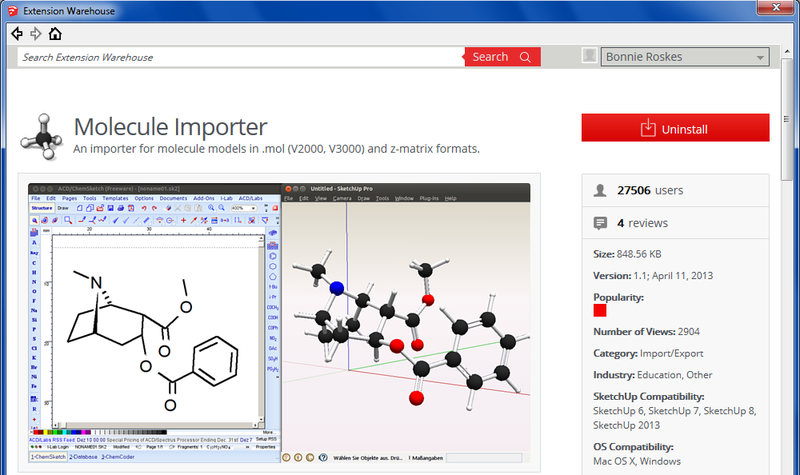 Search for "Molecule" and install the Molecule Importer plugin. It appears that this plugin will create models from files of several types of formats, but the format mentioned in the plugin's description is MOL. 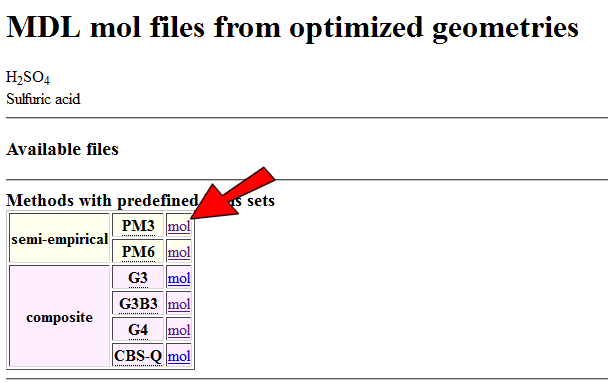 A quick Google search led me to this NIST site, where you can enter a molecule name and get its geometric layout as a MOL file. I entered H2SO4 (sulfuric acid), one of the few molecules I actually remember from high school and college. After clicking "Submit," I got a list of MOL files. I studied civil engineering, with pretty minimal chemistry training, so I have no idea what the various options are. I just clicked on the first one on the list. 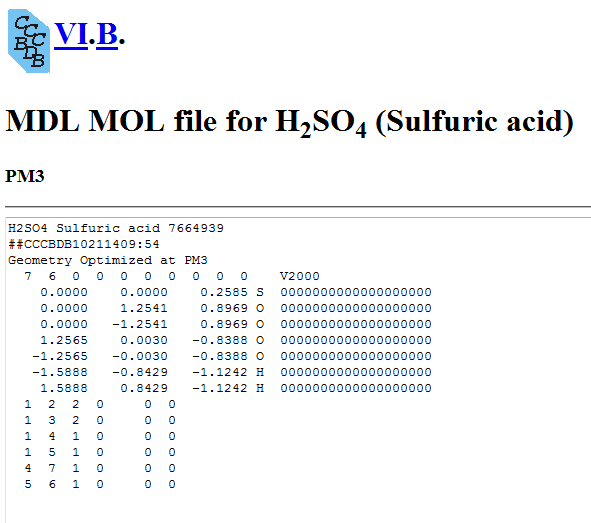 The text in the window that appears is the contents of the MOL file. So I copied and pasted all of the text into Notepad, and saved it as a file named H2SO4.mol. In SketchUp, the plugin has added more format options that you should see when using File / Import. But when I tried imported the MOL file this way, it didn't work. (Maybe that's what worked in previous versions but not 2014.) But you can also access the plugin through the main menu: choose Plugins / Molecule Importer / Import MDL Molfile. 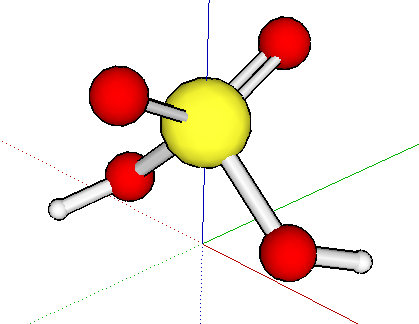 Here's my molecule: 2 hydrogens, one sulfur, four oxygens. All are the correct size, at least relative to one another, and the bonds are represented as well. I assume the layout is correct - NIST should know these things, right? If you measure the actual size, the entire molecule is about 30' long. I'm thinking this would be amazing to create on a 3D printer, which means a pretty major resizing. Another issue that will arise when 3D printing: if you look at the model in X-Ray view, you'll see that the bonds are too long - they hit each other inside the spheres. So they'd have to be edited and shortened.